Whilst there have been many cases where a soldiers’ promotion has not been notified until after they had died; there is no precedent for deliberate posthumous promotion in the Australian Defence Force though the promotion of Colonel Henry MacLaurin to Brigadier General on 10 July 1915, he had been killed in action 27 April 1915 CLICK HERE for details. General Blamey was very sick and close to death, and returned to duty for the day when made a Field Marshal after World War 2. He had to sit up in his hospital bed to be photographed with his uniform and baton, but he was alive when the promotion was mooted and occurred. 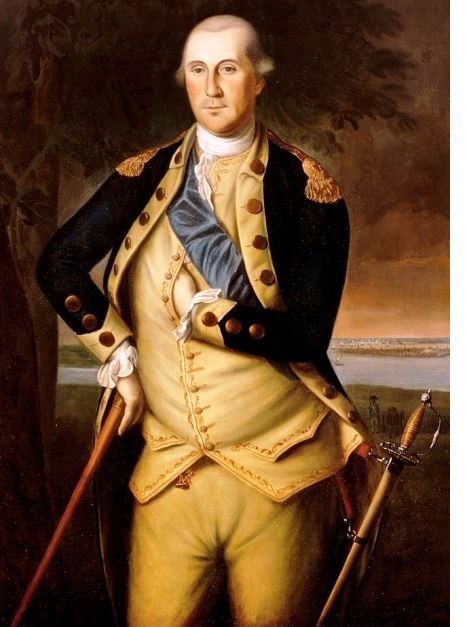 The precedent for promoting an honoured citizen and soldier posthumously to a nation’s highest rank is in the USA where George Washington was posthumously promoted to the rank of General of the Armies of the United States (a rank one higher than Field Marshal which is called General of the Army in the USA) in 1976. George Washington was the head of the Army that defeated the British and secured US independence, he became the first President serving 30 April 1789 – 4 March 1797. He died on 14 December 1799 and was promoted (Department of the Army Order 31-3, 13 March 1978) effective 4 July 1976. He had been dead for 179 years when the promotion was promulgated. CLICK HERE to download a copy of the document authorising the promotion. In Australia John Monash is held on a position of historic respect at least equal to that of Washington in the USA. He deserves equivalent posthumous honour. When a window of opportunity comes along to correct a wrong that goes to the core fabric of the nation, then citizens should step up and seek to ensure action is taken to rectify the wrong. This window exists from now until 11 November 2018, the centenary of Armistice or Remembrance Day. The rank of Australian Field Marshal is not suspended or abolished, it exists today and there is one current living holder of that rank, the Consort of the Queen of Australia, Prince Philip is an Australian Field Marshal created by then PM Robert Menzies on 1 April 1954. All Four Australian Field Marshals, 1925 Birdwood, 1938 King George VI, 1950 Blamey and 1954 Prince Philip were created in peace time and for symbolic reasons, at the time of their appointments none were in command of an AIF or ADF force of the size normally relating to Field Marshal command. Minister Dan Tehan has recently laid out some observations on Field Marshal rank as follows below. The Minister admits the ‘implicit’ requirement to be living but it is not an ‘outright’ requirement, further emphasising one step in rank as a desirable aspect. Promoting Sir John Monash posthumously to Field Marshal would represent one step in rank and like Blamey, when he was promoted in 1950, some years had elapsed since he was on active command duty. In the 21st century it is clearly a matter within the capability of the ADF, Minister for Defence and the Australian Prime Minister of the day to make senior promotions and appointments, it is not a matter that Whitehall or the Palace can prevent or obstruct. It is essentially an Australian matter for determination, one way or another and with indirect precedent. Note Minister Josh Frydenberg has said that a precedent is not essential to complete but not alter history by the Monash promotion. In 1976 George Washington was promoted from General to General of the Armies / Field Marshal +1 equivalent. Great Britain continues to appoint Field Marshals, the most recent is Lord Guthrie who was promoted to Field Marshal (Honorary) after he retired as head of the British Defence Forces. Staying with the limitation of one step in rank only, there are only some dozen Australian Generals ever appointed since 1901, three alive today, who notionally are eligible of one step in rank promotion to Field Marshal . In reality only one maximum two are within the remit for consideration of promotion to Field Marshal. Since the first Launch of the Saluting Monash Council on 6 November 2016 at the Shrine of Remembrance, Melbourne, the Saluting Monash Council has reached out to individuals, associations, politicians and Defence personnel to solicit their support for the posthumous promotion of General Sir John Monash to the rank of field marshal. This document summarises the case for the promotion and answers the opposing arguments. 1. Monash is Australia’s greatest soldier and an original ANZAC who had a major influence on the outcome of WW1. He is often cited as the most able General in WW1. His impact was of such significance that this alone should be enough to justify an Australian field marshal rank. His role, influence, understanding of modern battle technology and respect afforded him by the most senior war-tme leaders recognises that his legacy exceeds that normally expected from a Lieutenant General and Army Corps leader. 2. After the successful halting of the largest Offensive in history- Operation Michael- between the rivers Ancre and Somme in March 1918 and especially Hamel (4 July 1918) Monash’s opinion was sought by the highest level of Command and he was included in top level planning sessions usually restricted to field marshals or Commanders of Armies. He was of like mind to Generalissimo Foch as both understood the need to take offensive action not just be defensive as had been the strategy since the disastrous Allies offensive in the Somme beginning 1 July 1916. The success at Hamel gave confidence to the Allies High Command that Germany could be beaten. 3. Monash was responsible for the initial detailed battle plans for Hamel and the subsequent Offensive initiated at the Battle of Amiens beginning 8 August 1918. These were lodged with General Rawlinson and approved by CIC Haig and Generalissimo Foch though modified slightly. Previous plans for an offensive in 1918 were not proceeded with out of fear of a horrendous casualty count and defeat and there was a real chance that an Allies Offensive would be deferred until Spring 1919. Monash had a vision for victory. 4. It was a confident Monash who convinced High Command that victory could be achieved in 1918, thus saving many, some suggest, possibly millions of lives. Numerically, deaths under his command in 1918 were significantly less (50% and less) than those under his contemporaries in 1916 and 1917. Taking into account the numbers under his command who were sent into battle during the 1918 Offensives the death rate of around 3% was unheard of compared to earlier battles that often exceeded 50%. 5. The detailed planning and success by Monash to co-ordinate support services, Infantry, Artillery, Tanks and Aircraft as General Fuller attempted at the Battle of Cambrai showed a sophistication and understanding of modern military technologies not previously known. Monash has been called "The Father of Modern Combined Arms Warfare". His tactics became the blueprint for future offensive actions still relevant to this day. 6. Monash changed the practice of using infantry as cannon fodder, promoted on merit not class and was cognisant of the impact of his plans on casualty rates even at times when a ruthless approach was necessary to bring the war to a conclusion. 7. As Australia’s preeminent soldier he earned and deserves the highest ranking equal to Birdwood and Blamey both of whom never attained the same excellence in field command but were afforded symbolic (honorific) promotions to field marshal as proposed for Monash. 8. It will also honour the diggers who fought under his command and will be welcomed by their descendants. 9. Since 1954 the Australian Prime Minister can appoint Australian Field Marshal rank. It does not need a precedent nor necessarily follow the same criteria as British Field Marshals. Both Birdwood’s and Blamey’s appointments were precedents at the time. The Prime Minister’s recommendation after expected parliamentary consultation was approved by the Australian Head of State. 10. Monash was restored to the Active list for the period 1 January – 5 April 1931, that is, after he was made a full General thus allowing a 'one step in rank promotion. 11. The field marshal rank will correct the longstanding insult afforded Monash by primarily Prime Minister Sir William Hughes. To not do so will perpetuate the stain in Australian history. As the Hon Bob Carr past Premier of NSW stated in 1989 "the lack of recognition (of Monash) is one of the most distasteful episodes in our (Australian) history". 12. Monash was honoured by the awarding of a CB, KCB and GCMG by King George V (highest of any knighthood awarded to an Australian at that time); the Legion of Honour and Croix de Guerre from France; the Croix de Guerre and Order of the Crown from Belgium and the Distinguished Service Medal from the USA, but none from Prime Ministers Hughes and Bruce who even rejected calls to promote him to full General rank as was deserved in 1918 or at the latest 1919. 13. It is appropriate that this be corrected during the Centenary of WW1 for the opening of the Sir John Monash Centre at Villers- Bretonneux in April 2018. Correcting wrong always matters especially for Monash as his standing warrants equal rank to both Birdwood and Blamey. Is it also too long ago to commemorate Gallipoli, Western front, Boer war and the sacrifices made? Any nation state with fabric and standing will always reflect on and review its history and complete ‘unfinished business’ from time to time. Yes; there are streets, highways, hospitals, suburbs, a university, scholarships, Rotary Clubs, bridges, ships, iron gates, a Valley at Gallipoli, a RSL Sub- Branch, buildings, ovals, charities, sports ovals and soon a Federal electorate. Regrettably the name has become generic in many ways with large sections of the community having no idea what Monash stands for. For the younger age groups but not exclusively so, General Sir John Monash is a forgotten Australian. The Sir John Monash Centre in Villers-Bretonneux and associated publicity will help, but only the field marshal rank will place him on the top rung of Australian military commanders. This is probably always the case at any one time and the situation regarding the health and well being of current troops and veterans is of prime importance. But it does not mean it is an ‘either-or’ situation nor that decisions on issues other than those of prime importance should be rejected. Given his record of concern, understanding of ‘Shell Shock’ and personal assistance for veterans and their families during and post war, Monash set an example for compassion and respect. The case for General Sir John Monash to be given a field marshal rank is unique and based on his contribution as the most senior Field Commander of the Australian Army Corps and, as such, should not be seen as a precedent leading to other posthumous promotions. Whilst posthumous promotions to field marshal rank are exceptional and rare, there are US and French examples. The only other Australian who could be considered is General Harry Chauvel. In relation to history, this is not diluting history but as the Hon Josh Frydenberg states clearly: "It would, in a sense, complete history in relation to the Western Front and WW1 re our greatest Citizen General". It gives a salute that might also include Chauvel but that would be it. In turn, the work of the AIF would finally be better recognised. By restricting it to 'one step in rank' as this would be, means it effectively stops a deluge and limits litigation possibilities. As to retrospectivity, General Blamey's promotion in 1950 was made technically acceptable only after necessary 'adjustments' were made to his Active List status after the promotion was gazetted on 22 June 1950. Obviously technicalities can be overcome if need be. The can of worms argument is purely supposition and not relevant to a Field Marshal promotion as this is treated differently to other Officer ranks. Furthermore, it raises a questionable legal and ethical situation if one argues that one injustice should not be corrected because there are possibly other cases of injustice remaining uncorrected. Nothing would ever get done if this approach is taken. Each case has to stand alone. If there are other injustices these should be tackled not avoided. His command included international forces. As Field Commander of the Australian Army Corps in 1918, Lieutenant- General Monash had five Divisions directly under his command (approx. 166,000 Australians) making it the largest of all Corps. This was added to by American, Canadian and English at corps (2 US Corps), brigade or division level under the command of Monash making up the equivalent of over eight Divisions and 208,000 personnel; the equivalent of and sometimes in excess of a designated Army. Regardless of this, Monash’s impact as a field commander remains the most substantive reason. Englishman General Birdwood, appointed an Australian Field Marshal in 1925, was an able and popular leader among the Diggers as the first GOC of the AAC but never commanded more than four divisions of Australians and the divisions and Brigade were spread under other field commanders. Nor did he have field command of Australians above Corps level. Birdwood’s position as GOC- AIF was a senior administrative appointment and not a field command role. An analogy would be that of Company Secretary to Chief Executive Officer of a Company. The proposed promotion of Monash to Field Marshal does not, any more so, set a precedent than the appointments of Birdwood and Blamey did. In any case it’s the Prime Minister’s prerogative to set a precedent should he wish to do so. It is true Monash was considered humble and respectful of others and did not seek promotion but that is not the point. He was jammed at Lt General for 11 years after the 11th November 1918 when clearly he deserved General for that critical year in London (1919) as Director- General of Demobilisation. He always accepted his lot in life but that does not preclude others reaching decisions as PM Scullin did in 1929 in promoting both Chauvel and Monash. Monash’ diaries attest that, although humble, he did appreciate recognition and the status given to him by others. It is not possible to ascertain the Monash view and his descendants have taken a very correct and careful approach on the matter. Likewise George Washington could not be asked when he was promoted to five star General of the Armies in 1976- 176 years after his death. Much evidence by leading historians, Heads of State and senior Military Commanders supports his standing as an exceptional field commander and leader despite some attempts to diminish his role and discredit his writings and actions. Promotion can be backdated to time when Monash was on Active list and alive. Australians have every right and indeed an obligation to do so where we believe our history to be in error in fact or by omission, or incomplete or otherwise incorrect. Our history tells us who we are, what we stand for, where we have been and is usually a very accurate guidepost as to where we are going. There are numerous examples of recent attempts to correct or at least complete our history (the apology to the stolen generation, the apology to victims of sexual abuse etc etc) many of which are still works in progress. Hopefully we will also see a great improvement in the way we look after our Veterans especially those who are damaged by their service - a cause that General Sir John Monash would be passionately involved in if he were alive today! In his letter supporting the posthumous promotion of General Sir John Monash to field marshal, the Hon Dr Barry Jones stated "He was the victim of politics, prejudice and a striking lack of local self-confidence and optimism by leaders. " In the case of Gen Sir John Monash, his not being appointed Field Marshal at the time of it being due to him is a glaring example of an injustice perpetrated by the politics and prejudices of the day. We should regard this as unacceptable by our maturation and development as a nation and a culture. The stain of injustice will remain until it is corrected. For good reason these 'Unspeakables' are rarely declared as they are fundamentally 'unacceptable' for a multicultural liberal democracy such as Australia purports to be. Surely we, as a mature society, are past that?